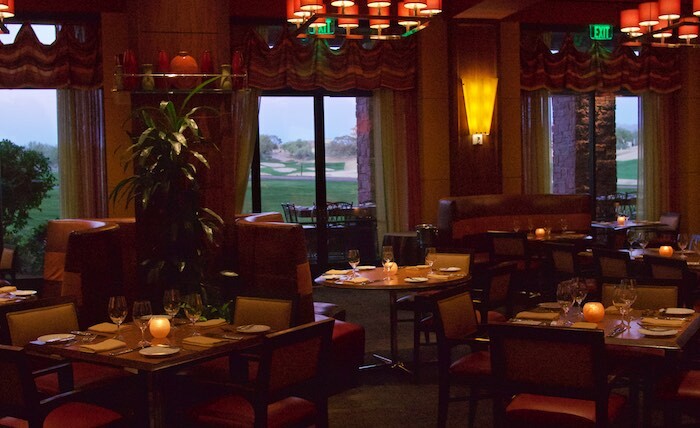 One of the most desired seats for dinner on Thursday evenings is at "the rail" at Deseo restaurant, located within the Westin Kierland Resort in Scottsdale. 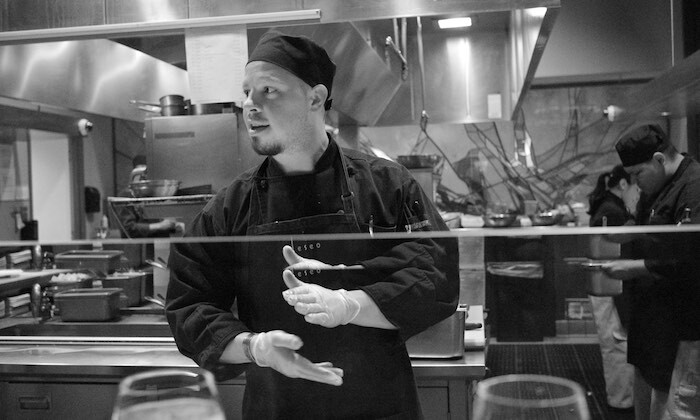 The "rail" wraps around an open kitchen where Chef Derek Biazo and his staff cook and plate dishes while as they educate diners on what they are about to eat. There are only twelve seats available each week for this intimate perspective into the Deseo kitchen, and they are the most sought after. 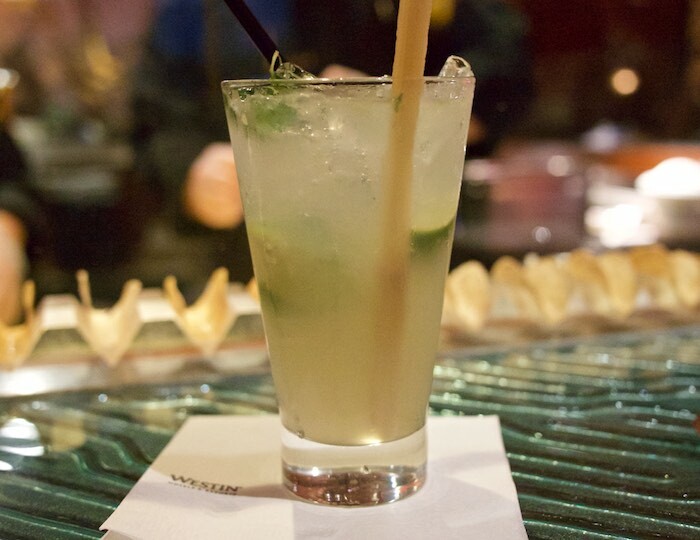 Though the menu changes weekly, each experience starts with a series of ceviches, which are prepared up close, and served with a muddled cocktail. The cocktail and ceviche is followed by a three course meal of the diners choosing. At $75 per person a seat at the rail is not only a unique experience but also an economical way to feast at Deseo. 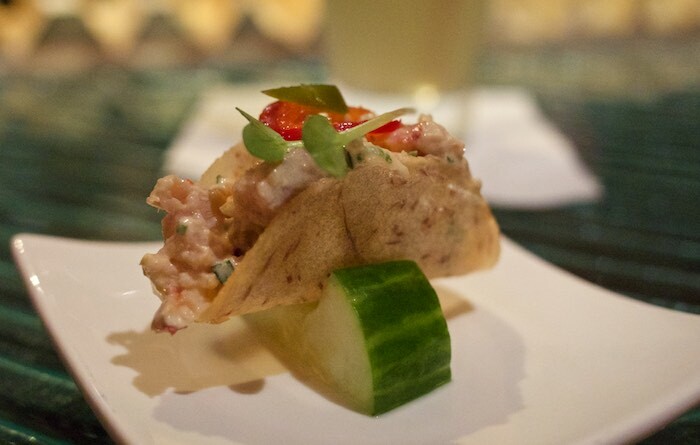 My favorite of the three ceviches we were given was the millionaire taco, which included, lobster, ahi tuna and Japanese hamachi served in a house-made yuca taco. I'm not sure where the name of this dish stems from other than you feel like a millionaire eating this decadent creation. As I mentioned above dinner is a choice of any salad or soup on the menu followed by your entree selection. 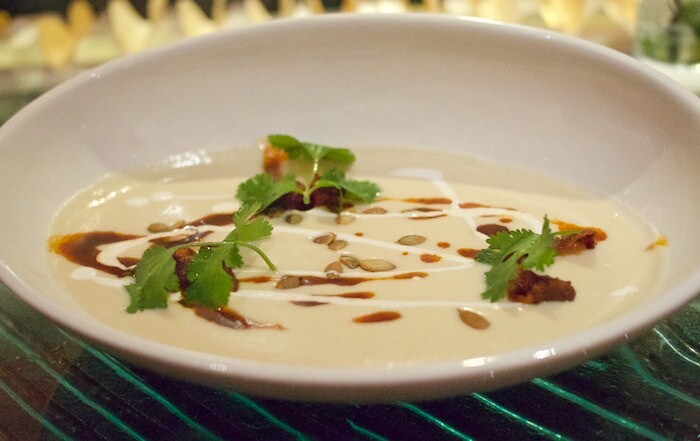 My husband and I both decided to try the white bean & chorizo soup, which was drizzled with cream and topped with pepita. The taste of this soup was like nothing I have had before and left us both with a warm comforting feeling. While most of our group went with meat I decided to give the big eye tuna encebollado, the chef's take on the classic Ecuadorian dish, a try. I was served two nice size pieces of cumin crusted tuna in a light tomato broth, which were accompanied by yucca dumplings. I have never eaten yucca dumplings before but would most certainly order this tasty dish again. 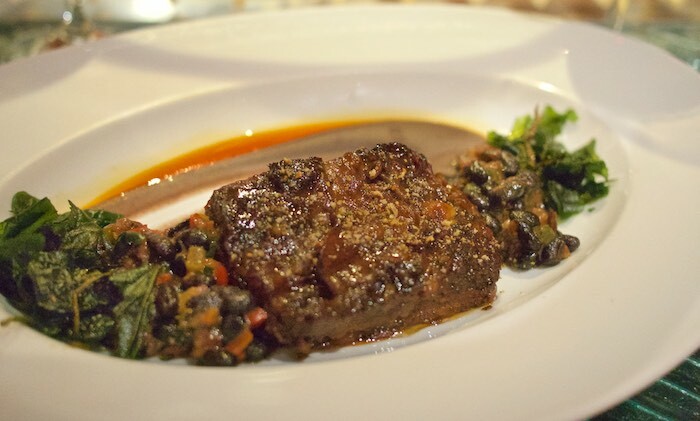 My husband ordered the braised wagyu short ribs and was impressed with how well the flavors melded. Served with black beans and farro I couldn't resist sneaking a few bites from his plate, when he wasn't looking. 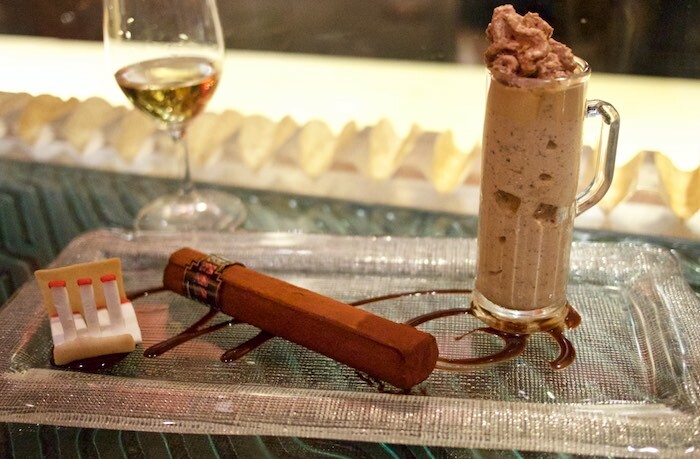 Dessert was the restaurant's signature chocolate cigar ensemble; chocolate cake and cappuccino gelato topped with a chocolate foam. 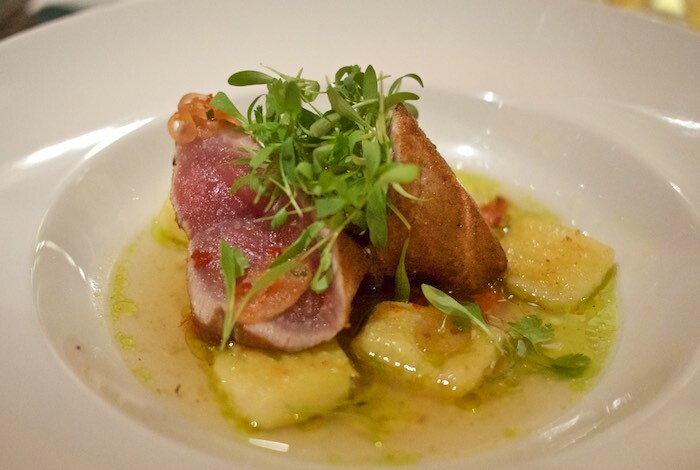 We've eaten this on previous visits to Deseo and have loved it every time. You really can't go wrong with chocolate desserts. Wow what fun! And the food looks great! I want to feel like a millionaire!!! What a neat experience and please, 1 cappuccino gelato! Their food is art! Love those kinds of restaurants. Hope to be able to go there someday. Thanks for sharing. This looks so great! You are so lucky you get to experience this! All looks fantastic..that millionaire taco is so what I would have ordered too! Delish! Looks like a great place to eat. Next time, could I go with? Wow what a beautiful restaurant. I feel like I was eating with you reading your lovely descriptions of the food. That dessert looks amazing! What an amazing night! The food looks incredible! We love finding experiences like that!